Teachers need to keep records of assessment for many reasons. Some subjects lend themselves well to this as the work outputted is on paper or takes a physical form. Physical Education lessons have a less permanent output. 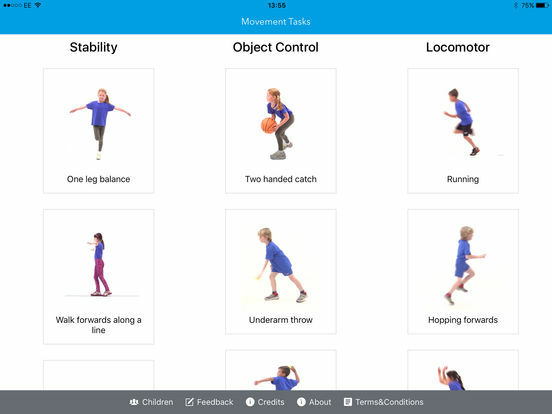 Movement Assessment Tool is a useful app to let teachers easily record and check their children's movement skills. The app needs some setting up. Each child's name and a few other details need to be input. After this, assessment can begin. Each of the 14 movement tasks covered by the app has a short video of it being performed alongside some key points, such as what the arms, legs, or trunk should be doing during the task. This is an excellent reference aid for the teacher. Using a simple drop down list the teacher then selects the child that they are assessing. At its simplest, the assessment is made by selecting the appropriate choice from a list - one each for arms, legs and body. This can be taken to a further level by using the device to record a video of each child and to add some written notes using the device's keyboard. There are a couple of minor issues with the user interface. A slightly less obscure confirmation of having chosen an option in the concertina menu would match the user's expectations a little better and make it easier for first time users to learn how it works. The positioning of the 'save' button on the comments section is also a little annoying as the on-screen keyboard must be manually dismissed before the details can be saved. In themselves, each of these is quite a minor issue but are the sort of thing that coalesce into irritation with extended usage. This is especially the case with an app such as this which will be used with perhaps thirty children in quick succession by a teacher juggling supervision and assessment. They are small points and should be easy to address so, hopefully, a future update will do so. The use of the data collected by the app's developer should be considered by schools. Videos are never shared but the data is, albeit in an anonymised form, according to the app's terms and conditions. The app's developer is the commercial arm of a charity so the data collected is intended for good use but these need to be reconciled with your school's own policy. The app isn't just good for assessment but is useful for teachers who are less confident in teaching P.E. Primary teachers are expected to be generalists but, inevitably, they will be weaker in some areas than others. For many, P.E. is a subject for which they have had little personal interest in the past. This app, with its excellent example videos, helps those teachers understand what skills they need to be teaching and what they look like. This isn't a perfect app but it is still a five-star one. Its usefulness and utility are what makes the possibility of new features being added so enticing. Movement Assessment Tool fulfils its purpose effectively, and it is a purpose not properly addressed by other apps. 14 movement tasks grouped within stability, object control and locomotor skills. Score each child in your class using a developmental stage approach. This will reveal if they are at an acquiring, developing or established level in each task. Scoring process is guided by video examples and written criteria. Tasks become progressively more difficult within the assessment. Video recording within the app allows children’s performance to be captured and evidenced. Assessment content is appropriate for the PE curriculum at EYFS and Key Stage 1. Assesses and records the fundamental movement skills competence of children aged 4-7 years old. Enhances assessment opportunities within PE and supports Assessment for Learning. Informs Assessment of Learning and can be used to assess at the end of a scheme of learning, term, year, etc. Supports teachers’ confidence and understanding in assessing and developing children’s fundamental movement skills. Creates a supportive learning environment for children to develop fundamental movement skills. Fundamental movement skills are the building blocks that allow children to take part in a wide variety of sports in childhood and as they get older. Involving Primary school teachers in the process of assessing fundamental movement skills, will enhance children’s learning and acquisition of fundamental movement skills. The period of 4-7 years old is a crucial time for children to develop these skills. The more competent children become in performing fundamental movement skills, the more likely they are to be physically active, have improved levels of health-related fitness and reduced risk of obesity. Three year research project led by researchers from Sheffield Hallam University. Developed with Primary school teachers for Primary school teachers. The assessment content and format has been informed by international experts of children’s movement development.